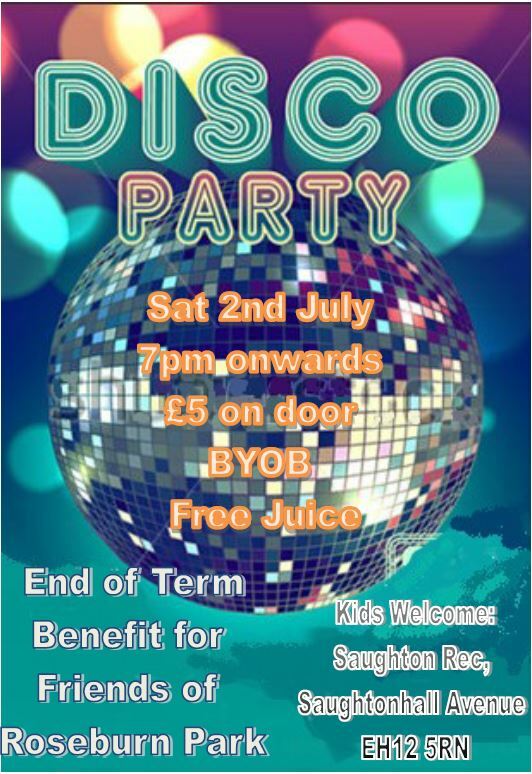 Come to a fundraising family disco (attached) on 2nd July at Saughton Rec. Celebrate the end of term by coming along. Feel free to bring (please don’t send) your children. See below for details! We are organising a special meeting for Friends of Roseburn Park members and other park users, on 23 June at 7pm, to hear about a major park development. Murrayfield Wanderers Rugby Club are leaving the SRU ground as their current lease has not been renewed by the SRU. They are seeking a new base, pavilion / changing rooms and pitches. Their first choice is to develop Roseburn Park. If you would like to hear their initial ideas come along to the Riversdale Suite, the upstairs function room at Murrayfield Ice Rink on Thursday 23 June at 7pm.